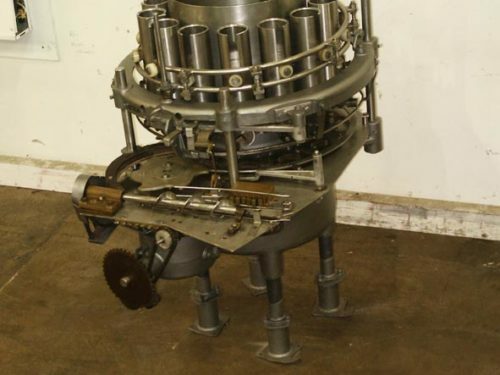 Fully automatic 10 head rotary piston filler capable of speeds from 50 to 250 cpm (depending on can size & fill). Has container size range: 202 – 404 dia x 101 – 700 Height, with proper change parts. Equipped w/10 gal (38 liter) 15 1/8" dia hopper, 41" L x 3 1/4" W conveyor, worm screw/starwheel infeed & spaces container 6.25" apart. Has 3" piston with min/max stroke of 1/2" – 5 1/4" for 21 oz max capacity .